Looking to squeak more MPGs out of your existing car, truck, or SUV? Check out our Roadmap to Better Gas Mileage! It’s a quick and easy read, filled with real world tips and tactics that can help you improve your fuel efficiency without shelling out tens of thousands of dollars on a new car or radically changing your driving habits. 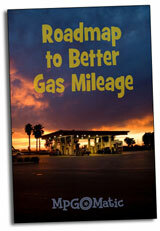 The MPGomatic Gas Mileage Guide has always been available instantly and free of charge. Just fill out the form and you’ll receive directions on how to download the ebook.